There are historical evidences that Lake Tana, Wolqait and other areas were under Tigray. they should be returned to Tigray. We thought TPLF was expanist and looking for territories that did not belong to them. But the historical evidence we have supports the claim of TPLF that Wolqait, Tselemeti, Tsegede and Lake Sana has been part of Aksumite kingdom, which is now Tigray. Tana is surrounded by two historically famous Tigrean regions:Gergera( the gudelaAmharu immigrants corrupted it to Gorgora), on the Dembian side and Adiet, on the western Gojamian side. Gojam was originally Tigrean and Agew land until the coming of Gragn Mohammed. It was fool of Abeto Robel of Tigray for letting the werada coward gudelaAmharas, Gafgates and Damotes, welaitas, kembatas, etc, to cross our Abay and to settle in our ancestral "Reesti and Gulti", Gojam and Bejamidri/Begamidri/Begemidr/be-ga'y-midr. Amharu language was ne3=ver ever spoken in Tigrean Gojam and Tigrean Bejamidr let alone in Dembia or Siemen, until the infamous gragn era, when, sad as it is, so many coward tribes from Gudela and bantu parts of what we now wrongly call Ethiopia, crossed the Tigrigna-named Abay River, seeking refuge in the lands defended by epic Tigrean warriors who kept Gragn mohammed pinned down until they defeated his forces at Nebelet, central Tigray, and chased and killed him in Dembia. ወይኔ... ምን ኣባቱ ይሆን ነበር? Tigray Region includes Gondar, Lake Sana, Gojamme area, Eritrea. Djoubiti also belongs to Tigray. Thus it is a huge task to calim all thse territories. We hope Tigray gets Gondar and some of the Wollo areas, which were recently taken from it. Also some of the Afar are should be given back to Tigray. It is important to have a government that defends Tigrayans and all people in the cursed land Ethiopia, where the government support mass dispalcements and killings. Who are the Tigray people you are talking about. Anderta, tembien and irob don't want to be in blood s'ucker filled tigray and don't want to be associated with people that hate Amara... they know better. That is why they are telling you to get the hell out of mekele and go back to Adwa. The God of Ethiopia is powerfule! You cannot say brave Tigrayans when your lands are under the enemy and feeding the enemy children while Tigray children are in need of food??? 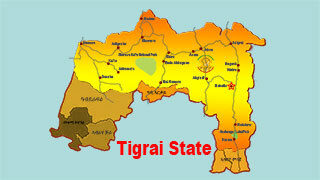 Regain your lands named in Tigrigna by the original owners Agaazian Tigrayns and sing Tigrayans are brave. Thus far you are not brave but deceiver who tries to cheat your own soul by lying to your own soul. Tigray lands looted by Amhara pending for their liberation. All names are pure Tigrigna Amhara does not know any word of Tigrigna and worked so hard to destroy Tigrigna language for 100 years let alone to name the language they hate and do not understand one word. If Oromo can claim Addis Ababa because the name is or was Fenfene, why not Tigray lands their name is still intact with the original named by their owners Agaazian Tigrayans??? 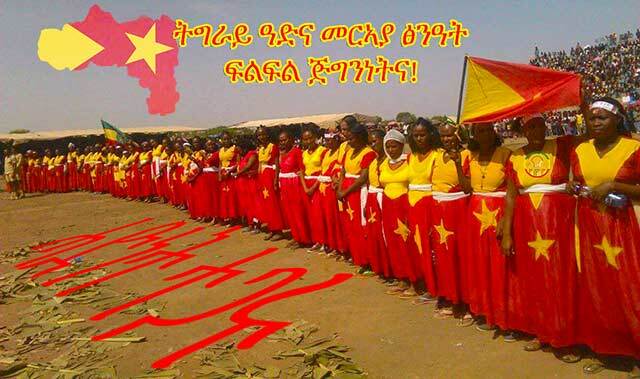 it is about time now that our Tigray brothers started to see the true history of Ethiopia . The Amhara AND TIGRAY PEOPLE ARE THE SAME AND ONE.they started to see the true History and soon the two brothers will unite again and fight there enemies like before. It is always easier and better to attract people than to force. Its cheaper, more economical and long lasting. First build what you have. I also believe that tribes grow and split. That is natural. If somebody goes to South or Shiwa and grows into different kind of society. That is it. Who made Axum tigray ethinc ? Those two are unrelated and one can't claim the other. The Axumite were Agazian people who are now extinct. አሁንስ ውስጥ ወጣችሁ ትግሬዎች። ደቡብ ጣና (ከቁንዝላ ወይም ሊበን፣ ጃርሶ፣ ሜጫ፣ ኢልማን ዲንሣ ማለትም ባህር ዳር አካባቢ በተለምዶ ይልማና ዴንሣ የሚሉት)ግን ኦሮሞ ተይዟል (booked by the Oromo Nation). Never claim these areas. The solution is that we (Oromos), Shinasha, Berta, Agew, Waito, and Tigre sit down to settle our border based on ancient history. AS such there is no what is called Amhara but Amharic only.